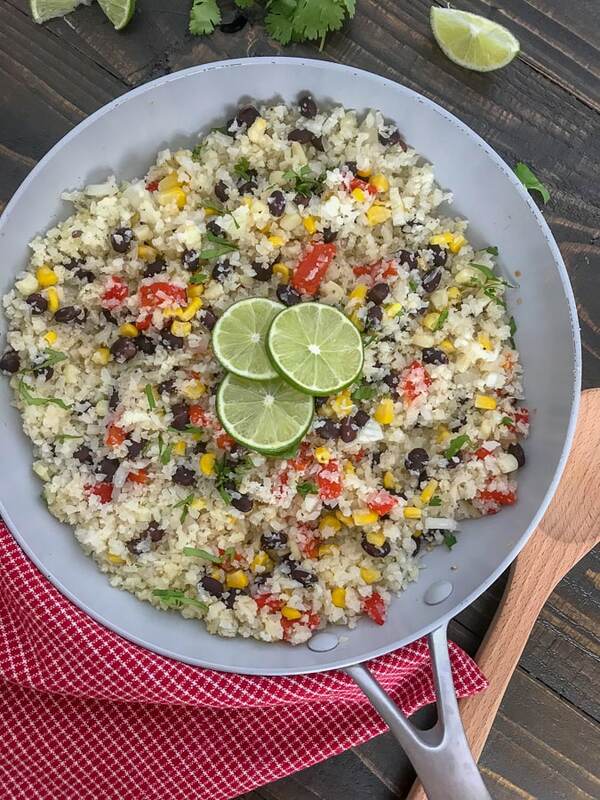 Cilantro Lime Black Bean and Corn Cauliflower Rice – an incredibly easy and flavorful side dish that is packed full of veggies and can be on your plate in 15 minutes or less! 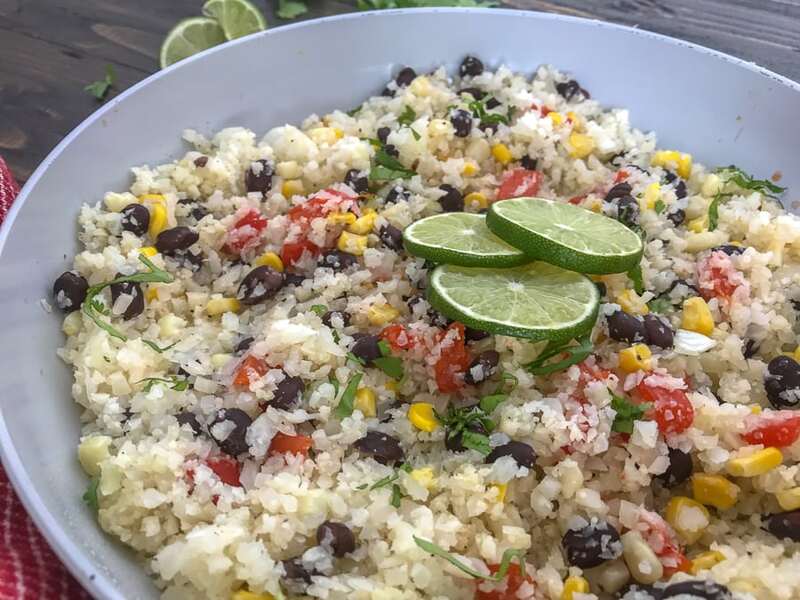 It combines cauliflower rice, black beans, corn, roasted red pepper, and sautéed onions for a the perfect side dish. Only 115 calories per serving! The versatililty of cauliflower is such an amazing thing. Who knew you could use a simple vegetable to replace so many things! Rice, alfredo sauce, pizza crust.. the list goes on! There is hardly a week that goes by where there is not some form of cauliflower that makes it to our dinner plates or prepared lunches. And I am pretty sure I always have a form of it in my freezer. And when you’re a carb-lover like me, it’s a great option to have to lower the amount of breads, pastas, and rice you eat! 😀 I’ve yet to run into a flavor combination with cauliflower rice that I haven’t enjoyed. One of my most recent favorites is my Easy Cauliflower Broccoli Egg Fried Rice. A wonderful, healthier alternative to takeout! So if you haven’t tried that recipe out yet, then you need to! This side dish is so flavorful and simple to make that it has become a fan favorite in this house. Who doesn’t love simple and delicious?? I certainly do! Especially with my busy schedule. It’s great as a side dish for dinner, packed lunches, added to a wrap, and even for weekly meal prep! You can add more black beans to this dish if you would like to add more plant-based protein. Or you can add your favorite cut of lean meat; whether its chicken, shrimp, turkey breast, or fish of choice – it pairs well with just about anything. 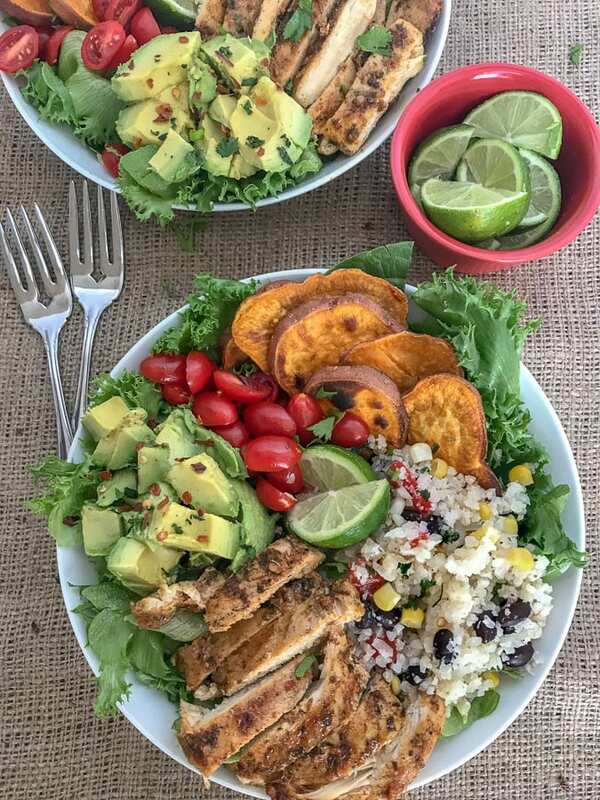 I paired it with my Easy Grilled Jamaican Jerk Chicken in a bowl full of extra veggies and avocado, creating a super delicious Jamaican Jerk Chicken Bowls! A simple, yet delicious bowl full of veggies. You can squeeze extra lime juice over the top (yum!) or serve it with your favorite dressing. I enjoyed it with a little hummus and extra lime juice. 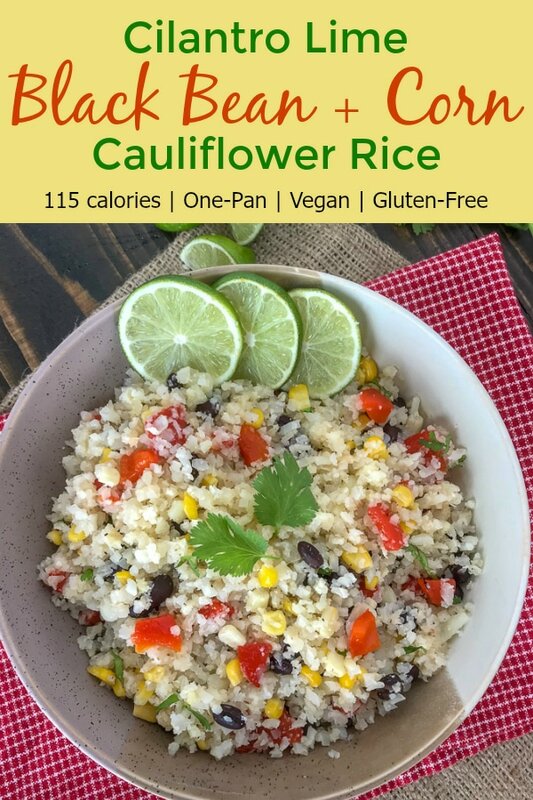 The cauliflower rice and veggies are sautéed in olive oil, but you can easily swap it with coconut oil or butter to suit your flavor or dietary lifestyle. As mentioned above, you can add more black beans (or pinto to keep it gluten-free) for additional plant-based protein. If you’re not a fan of cilantro, feel free to omit or replace it with freshly chopped parsley. 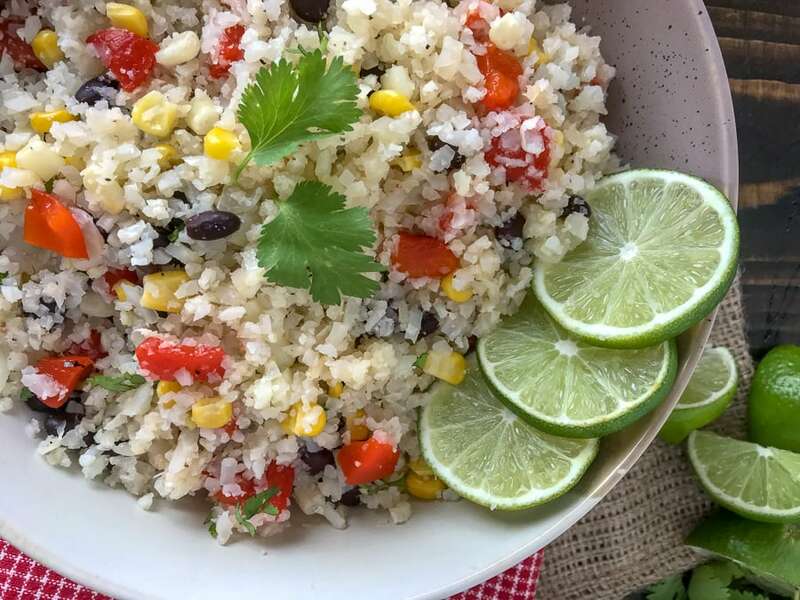 You can use frozen cauliflower rice or fresh, homemade cauliflower rice. I highly recommend the latter. So much more flavorful. Fresh is always best. But frozen works great in a pinch! If you’re a fan of this dish, then you will absolutely love a few of my other cauliflower-based recipes! 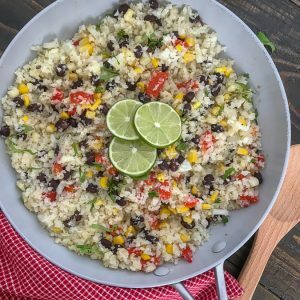 Cilantro Lime Black Bean and Corn Cauliflower Rice - an incredibly easy and flavorful side dish that is packed full of veggies and can be on your plate in 15 minutes or less! 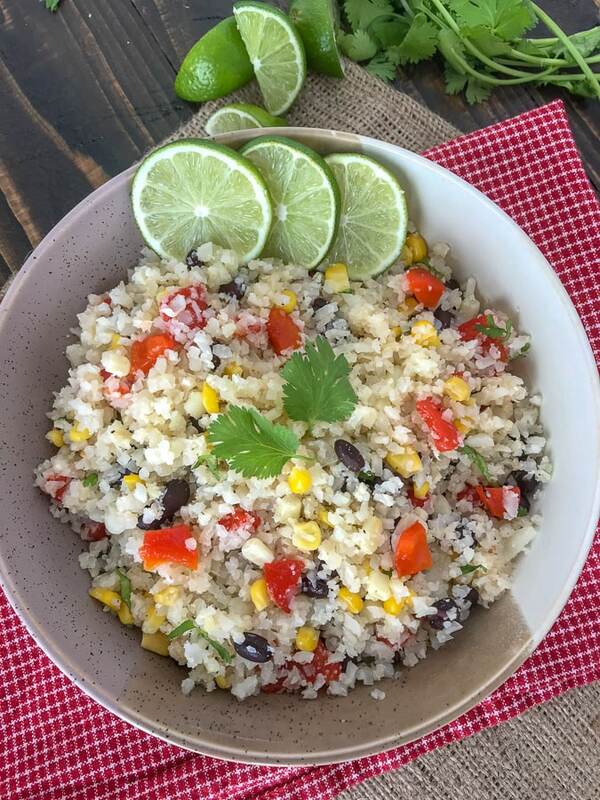 It combines cauliflower rice, black beans, corn, roasted red pepper, and sautéed onions for a delicious and perfect side dish. Only 115 calories per serving! Once heated, add the chopped onions and allow to sauté 2-3 minutes or until translucent. Add the cauliflower rice, corn, black beans, and diced roasted red bell pepper. ** Season with salt, pepper, and garlic powder. Stir to thoroughly combine. Sauté for 3-4 minutes. Remove from heat and garnish with lime juice and freshly chopped cilantro (or parsley). *Can substitute with coconut oil or butter. **You can find jarred roasted red bell pepper in the specialty section or pasta section at most grocery stories. But you can always substitute with diced raw bell pepper. Add it to the pan with the onion to cook it down a bit and not when you add the rest of the vegetables.